A child may not tell you that he or she has a vision problem because they may not know what they are missing. A vision screening at school is not an eye examination. Schedule a comprehensive eye examination today. Up to 60% of learning difficulties are associated with vision problems. One in four children have a vision-related condition. Eyeglasses may provide the needed correction for many of these vision problems. 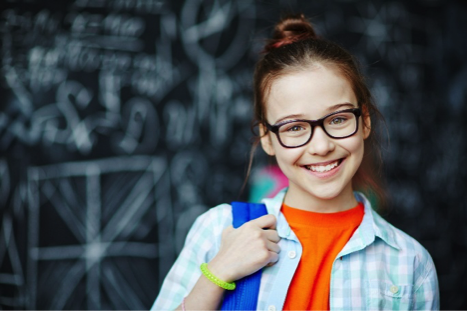 The Eyecare Professionals at Parrelli Optical® specialize in fitting kids to good-looking and comfortable eyewear. Sports vision and eye correction for your child. Dress eyewear may look great, but it offers little protection on the sports field. Many schools now require sports eyewear for their student athletes. Protect your child’s vision and improve their sports performance with approved Sports Eyegear from Parrelli Optical®. Single use, daily disposable contact lenses; just wear them once and throw them away. They are soft, safe and comfortable. These contact lenses are also perfect for young people. See a Contact Lens Specialist at Parrelli Optical® for a FREE consultation.